Ever since I saw this post on "Spring Cleaning your diet" at The Gardener's Cottage I have been eating salads every day. There are so many great things to make a salad interesting. I love beets, but red beets are pretty messy. I was so happy to find golden beets at Whole Foods this week. I roasted the beets in a little olive oil wrapped in foil individually for close to an our in a 425° oven, I let them cool for about ten minutes and peeled them. I sliced them for the tart and cubed them for the salad. For the dressing I whisked a little olive oil, champagne vinegar and Dijon mustard and tossed it with mixed baby greens, beets and avocado. The tart is just a little puff pastry with a shallot sauteed in olive oil and a splash of wine, spread it over the pastry, layer the golden beets, add a little goat cheese, or not and bake for about 25 minutes at 375°. I topped it with micro greens from Trader Joe's. Yum. I´ve never eaten golden beets, just red. Do they taste the same? 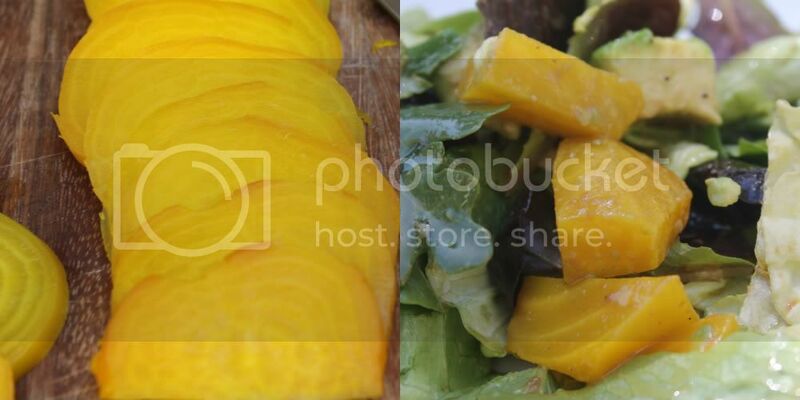 I just had my first golden beet a few weeks ago…I bought mine at Trader Joe’s, too! Love that store! Your tart looks scrumptious! A great way to serve those beets! I actually bought my beets at Whole Foods…sorry….but I do love Trader Joe’s! I grew yellow beets in the bungalow garden last year and I love how sweet their flavour tastes. Gorgeous Annie! I love the photos and the recipe. Question for you, how do you do the side by side photos? I tried to do that on a post and blogger would not let me. The beets look yummy and I am not a beet person. Janet is an inspiration - after her weight loss post I added weights to my routine and have been consciously eating healthier. Now I want to experiment with Quinoa. I only really like salads when they have some seriously fun components...and roasted veggies are definitely fun! My hubby loves salads - but I am usually uninspired by them. Yours looks amazing, I shall have to put this together. The hubs will be so pleased. Looks incredible! I have been eating a lot of salads lately, too, but the puff pastry is calling my name! I'm a sucker for anything with puff pastry. Yum! You have the best ideas Annie - do you know that I have never had a golden beet! Puff pasty oh how I love thee!! you inspire me as always! I must now try a golden beet. My newest food obsession? Fried egg over easy atop a spinach salad with white balsamic vinegar. I tried golden beets. Prepared them just as you suggested and they were delicious. And, not messy like their red counterparts! I love finding a new vegetable to enjoy. Thank you! Yum! We made dinner salads last night. Fingers crossed spring comes back to Boston soon! I might love beets more than any other vegetable. They are so divine -- especially when pared with goat cheese and vinaigrette. This recipe sounds out-of-this-world good! So lovely, so healthful, and so unique. I love anything with beets and this recipe is tantalizing in my world. Cheers to you my dear! wow...this looks delicious...your images are magazine worthy...beautiful! This looks delicious. I am really beginning to like beets. I love the puff pastry part too. Of course you make it all look so pretty. a quest for living simply lovely. I love beets too.